this looks like a 1/6 berserker armor in action, finally a well done piece. Good job. I've been gone for a bit, but I had to comment on this one! The model is under supervision of Hakusensha now. This time Mr. Miura has supervised the face and helmet expression himself! We ourselves cannot wait to see the finished one. The pictures of the uncolored model will be opened on our Facebook page soon. This will be the most exciting item in ART OF WAR, 2013. *Pre-order will start around the third week of November. That right there is reason enough for me to buy it. I've sent many emails to AOW about how we are all so disappointed with the faces on their statues, and that they should try and work with Miura on the face, just like how they got Oku's approval on the latest Gantz statue (which is ten times better than their first Gantz statue). So, I'm really thrilled they decided to do it, and I'm happy Miura agreed to help too. Can't wait for this. Fact that Miura checked it out is awesome! Can't wait to see this in all color. 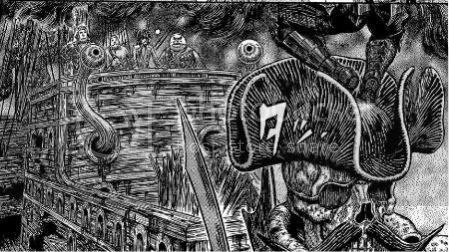 It's pretty cool that Miura worked on the head, though with the helmet on I don't think the face matters too much in this case. In fact it's not supposed to be visible at all in this scene (covered by the black fluid from the armor). Considering how gigantic it is (54 cm! ), there's a chance this could be one of the most expensive pieces they've ever done. I think it's going to be about the same scale as 20th anniversary model, so I'm expecting this one to be atleast 90 000 Yen. It looks great, can't wait to see the reveal. 2013 so far has a couple of new pieces - I like this development. Yeah, for 90k ien, i don´t know, the base is whats bothering me a bit, but I'm anxious to see it. I was just about to get the "Armored Berserk and Fire Dragon" and/or the Headlong version at YJA but since this is almost the same pose and quite a lot bigger I guess Im gonna have to wait and see here. Fortunately I got my 20th anniversary Berserker, and i'm not paying (what i'm presuming is shittons of money) for another crouched, ball of Berserker armour. I would like to see some more dynamic poses with the Berserker Armor. Imagine a diorama of where he rips apart the apostle that ate him? would be awesome & gory. I'm actually interested in seeing what the price will turn out to be, because this is the first time they did this sort of 'coming soon' announcement. If the announcement is from bizarro world, maybe the price is aswell? This is a tall statue with it's base. The last tall release was Skull Knight 2011 which was 40 cms high (base included), priced at 90,000 Yen back then. But the base was a full horse. 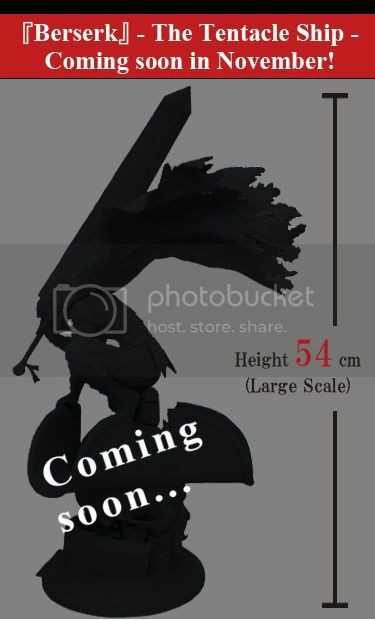 By the picture and height indication, Guts and his sword seem to be about 35-38 cms. That's tricky, in the sense, the height's due to the sword's angle upward. 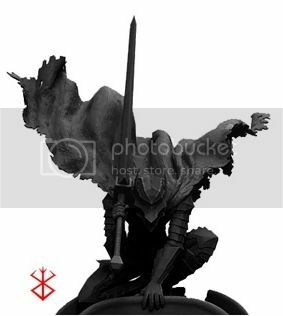 Stepping out of the Lurk Zone to say this statue looks awesome. 2nd that for the stepping out lurk zone and excited for this, hope AOW does not fail on this one. So this item is now called The Tentacle Ship .... not sure what I feel about that title in conversation, or in general. Outside of that first image, we can see 2 more online on their official sites. The handle of the sword in the statue looks longer, prolly an extra palm's length. Please edit your posts, andrewdsz ^_^. Yep, Guts' scale was predictable when we first saw the statue. The height comes from the base and the way the sword's held. I'll never understand how these statues get to the final stage with something like the DS's handle being twice as long as it should be. Don't these things go through a long approval process? Anyway, that aside, I'm glad the statue will be a little smaller, and hence, a little more affordable. 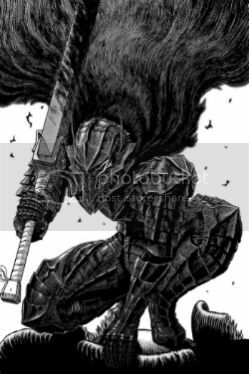 Meh it's an easy pass on this for me guts himself looks to be so small aswell as it being yet another guts i mean hes awesome and all but i want some DIFFERENT characters! I also doubt they'll lower the price they'll use that "54cm" as there excuse to charge whatever they please.